I see there's a new process along with a priority point system this year but haven't received anything in terms of when the season tix will be available. Last year they were available about this time. Anyone hear about this years timeline? We can still renew our season tickets, right? The link to renew doesnt work and the countdown clock is at zero. Im guessing its just not up yet. But, Im panicking a bit. We won’t be asked to renew for a while yet. You will get an email and regular mail notification. I don’t think Phat Cat is going to renew with the price increase. Maybe you can buy his if needed? The football season ticket deposit program for new season ticket holders and season ticket renewals have started. Interested fans can put down a $100 deposit that will go towards their season ticket purchase HERE. For more information on season tickets, please contact the Bobcat Ticket Office by calling 406-994-CATS or in person at Brick Breeden Fieldhouse. Is there any where to get prices for next year for different levels and sections before doing the $100 to reserve. This is the letter I got from Bobcat Club about the new process and prices. Cat_stache_fever listens to Nickelback...and enjoys it. Season ticket renewals will begin Monday, February 4 and the deadline to renew will be May 1st. All season ticket holders will receive an email Monday morning with their account information. New season tickets will not be on sale until this summer, but you can secure your place on our priority waiting list with a $100 deposit. Season ticket prices have remained the same for this year, though we have moved to a 'per-seat' instead of 'per-section' contribution model for your required contributions. I am wondering how to and what it costs to get passes to the stadium club? 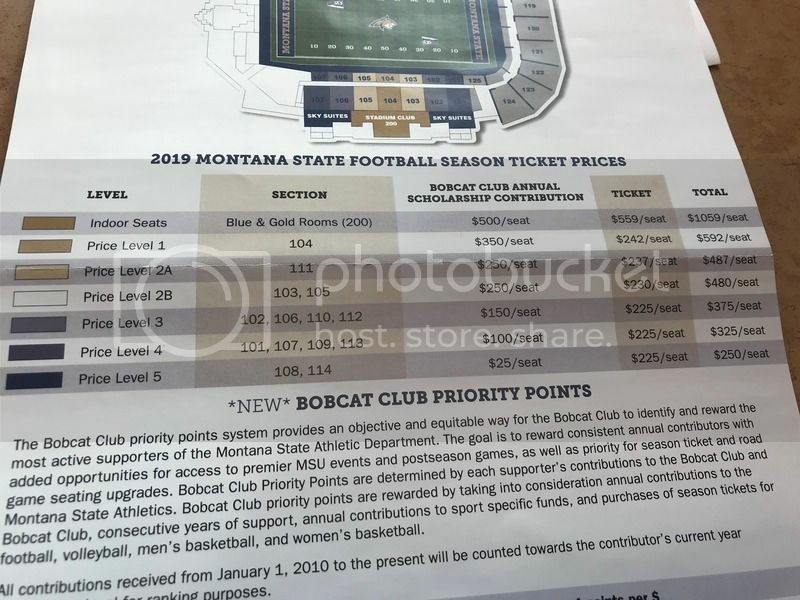 Stadium Club passes are available to members of the Bobcat Club at the $900 annual level and above and cost $257 each. Thank you. Is this the same if your a Quarter Back Club member? Nope. That doen't count toward Bobcat Club. How do I get on the list for future seats that won’t be added until the East side is rebuilt? I am thinking that when the new East side is put in, I am going to move my seats. I would love to have the #1 pick of those seats. Guess what I am saying is that if there isn’t something already in place for this, there should be and since it was my idea, I get first pick. This topic should say "Season Tickets Available For Purchase" , because they sure in hell are not on sale. A increase in price, is not a sale.